Eliminates tobacco, food and pet odors from the air, carpet, linens, upholstery, clothing, and more! 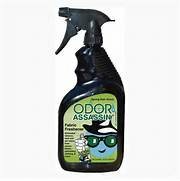 ODOR ASSASSIN Air & Fabric Freshener is a professional strength odor eliminator formulated to quickly and effectively remove trapped odors from all types of fabric. Contains a patented odor neutralizer that eliminates odors - doesn't just cover them up - and they don't come back.